The most recent car booking in Miskolc has been made on our website 4364 minutes ago. In Miskolc, we offer for rental 4+ car categories from 2+ rental suppliers. 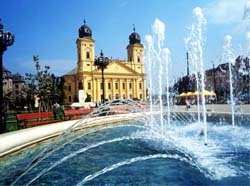 OrangeSmile.com combines car offers from absolutely all rental suppliers located in and around Miskolc. As an aggregating system, in Hungary we are able to provide reduced rental rates that are, in most of the cases, lower than you can get from the suppliers. The search form above allows you to find these offers in Miskolc on any desired period. You can also specify a return location in Hungary different from the pick-up place. The maximum rental period is 30 days. The cars for rent presented in the search results for Miskolc are just example models for each specific offer. Unfortunately, for Hungary we are not able to tell in advance which specific car model will be given at the desk. Rare vehicle types, such as convertibles, sports cars, large off-road vehicles or minivans are available in Hungary mostly at airports. If you are looking for such a car type, please check the airports nearest to Miskolc. We wish the most exciting discoveries while driving around Miskolc! For those that choose a suitable place for outdoor recreation, it is necessary to pay attention to the Nagyerdei Park. This park is simply huge and resembles a real entertainment center; everyone will find something to do according to their taste. In the park, there is a landscaped area with benches, fountains and beautiful sculptures. There is also a so-called forest zone - an ideal resting place for nature lovers. For children in the park, is equipped a lot of playgrounds and sports grounds. One of the city’s football stadiums is also located here. In the warmer months of the year, there is a water park in the territory of the Nagyerdei Park, with attractions and summer cafes. On a rainy day with children, you can go to the Agora Science Centre. It is very bright and interestingly decorated. Excursions are held here for children of different ages. The main goal of the museum is to show the kids how interesting and multifaceted the scientific world is. The museum has a lot of interactive expositions, which are demonstrated by certain physical laws. The children are allowed to touch many of its exhibits. Children can be able to participate in a mass of interesting experiments here. In addition, the center has created excellent conditions for children’s parties.